Gourmet Cooking – Vegetarian Style! Enjoy these gastronomic delights that will tantalise the taste buds of the most committed meat lover!! Invite your friends to a scrumptious dinner, using these very interesting and tasty recipes. Add variety and a touch of spice to your cooking with these vegetable tips that will truly surprise your guests, even faithful vegetarians. The contributor of this feature is Nirbeeja Saraswati. Nirbeeja has been vegetarian for over twenty-two years and has been teaching vegetarian cooking in Canberra for over ten years. She is very much influenced by ashram cooking while maintaining an individual style. Lesson 1 : An informative session on vegetarian diet, discussing related issues such as health, energy, etc. In this lesson, two soups are prepared and presented as complete nutritionally-balanced meals. Lesson 2 : Rice and Tofu dishes. 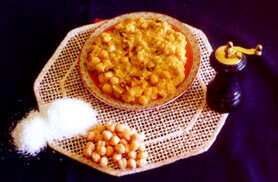 Lesson 3 : Dhal and Chick Pea dishes. Lesson 4 : The Individual Vegetable. Lesson 5 : Oven-Cooked dishes. Lesson 6 : More Vegetarian dishes. 1-Day Cooking Classes are also offered  Saturdays 10am to 2pm. You will learn to prepare and cook a variety of dishes including, rice, tofu, lentil and just vegetable. Drain and wash chick peas. Cover and bring to boil. Simmer and cook about 2 hours. In heavy based saucepan, cook onion and garlic with a little water until soft. Add curry powder, cumin and coriander and stir until they change colour, about 2 mins. Add flour and coconut and cook for further 1 min. Add water slowly and stir until mixture thickens. Add sugar and chick peas. Cover and cook for 30 mins. Add dates and cook further 15 mins. Stir in lemon juice and serve with brown rice, green beans and sweet potato. 500 grams firm tofu - chop into small cubes and fry in 1 dessertspoon olive oil until brown on all sides. Steam cauliflower for about 5 minutes. Set aside. Heat ghee or oil in frying pan and when hot test with a few mustard seeds. If they pop, add the rest. When they have finished popping, add cumin seeds and cook for a few seconds. Add onion and cook until clear, then add the turmeric. 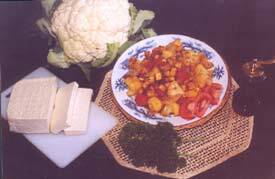 Add cauliflower, stir well and cook until the cauli is just tender, add chopped tomatoes, cooked tofu cubes and salt or tamari and cook for another 5 minutes, then add lemon juice. Pour the mustard dressing over the vegetables and serve. Compared with most white rice, brown rice is more chewy, with a delightful nutty, sweet flavour. It is also high in much-needed B-complex vitamins. It can be sautéed and cooked in the same way as white rice, the only difference being the length of time it takes to cook. Brown rice should cook for at least 45-55 minutes to become soft and flaky. Serve long-grain brown rice with a light vegetable dish accompanied by bread and salad. Bring the water, salt, and bay leaves slowly to the boil in a heavy 2 litre saucepan over moderate heat. Heat half the ghee or oil in a 2 litre saucepan over moderately-low heat. When hot, stir in the rice and sauté for about 2 minutes. Pour in the boiling salted water. Stir, raise the heat, and bring the water to a full boil. Immediately reduce the heat to low, cover with a tight-fitting lid, and gently simmer, without stirring, for 45-55 minutes or until all the water has been absorbed and rice is tender and flaky. Heat the rest of the ghee or oil over moderate heat in a heavy pan or wok. Sauté the asafoetida and black pepper momentarily in the hot ghee/oil. Add the ginger and sauté for ½ minute. Stir-fry the cauliflower pieces, celery, peas, peppers and carrot straws until tender. Add the cooked corn, tomato pieces, chick peas, peanuts (or cashews), sesame seeds and parsley or coriander and combine well. Remove from the heat. Fold the vegetable mix through the rice and serve immediately. Variations: Squeeze some lemon juice over the finished dish and mix through. Fry some thin strips of firm tofu and garnish the top of each served portion. Pre heat the oven to 200ºC. Cover the lentils with plenty of water, bring to the boil and cook for 10 to 15 minutes. Drain. Meanwhile, steam or boil potatoes until tender. Gently sauté onion, celery and carrot with the herbs and spices until tender. Remove from heat, add potatoes and lentils, add tamari and pepper, and stir in garlic, sour cream and butter. Transfer to a shallow casserole dish, sprinkle with grated cheese and bake for 15 minutes or until cheese is golden. 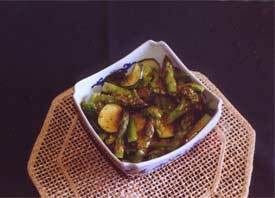 Also can be served with steamed greens and a small portion of boiled rice, or a garden salad. Dry fry cumin seeds until they just change colour in saucepan. Add oil, then onion, chilli and turmeric. Cook gently until onion is clear, then add garlic and ginger and cook for a minute or so. Then add coconut cream, pumpkin pieces, peas and salt. Allow to simmer gently for 20 mins or until vegies are cooked (pumpkin shouldnt be mushy). Add small amounts of water during cooking if necessary. Add coriander and mix through, then take off heat. Serve with dhal, rice and a spoon of yoghurt. Meanwhile, dry fry cumin seeds until just changed colour. Add oil and chopped onion and cook until onion is translucent or golden brown. Add coriander and turmeric. Cook gently for a couple of minutes. Stir in ginger and garlic, then add this mixture to cooking peas. Add salt to taste. Dhal can be thick so don't add too much water, but stir it occasionally so it doesn't stick. If thin dhal is preferred, add water as needed. Cook enough to last a few days (depending on the number of people, you may need more than 1 1/2 cups split peas). Serve it over or with rice and a vegetable dish for your protein, carbohydrate, mineral and vitamin combination. Can also be used as a base for soups.